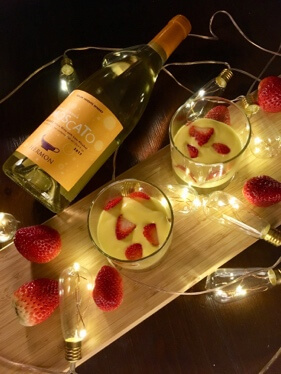 I recently received this sample bottle of Moscato along with a simple, sweet Zabaglione dessert recipe. Since I don’t drink sweet wine often, I wanted to learn more about this sugar-forward beverage (which so many people love!). The Muscat Blanc grape, just like other wine grapes, can be made into sparkling, semi-sparkling, dry, sweet, or even dessert versions. Muscat also has many different names, as many wine grapes do: Muscat Blanc à Petits Grains, Muscat of Alexandria, Muscat Ottonel, Muscat Rose à Petits Grains, etc. There are over 200 varieties belonging to the Muscat family of grapes, and while they’re grown all over the world, this one hails from northern Israel. If you love sweet wine, you’ll love this. 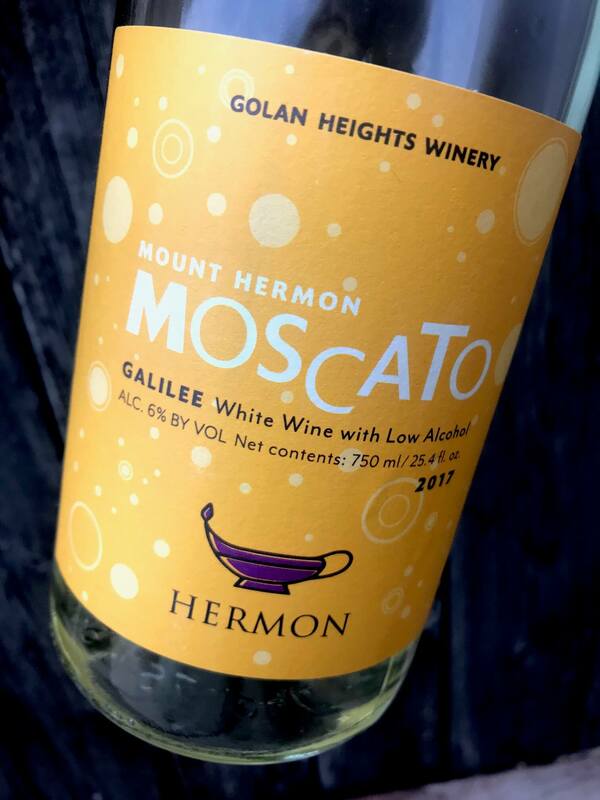 Mount Hermon 2017 Moscato ($14), is made from Muscat Canelli, grown in the Galilee (or Galil) region of Israel. Golan Heights is considered to be the highest quality appellation (and coldest), with vineyards 1,300 to 3,900 feet above sea level. The 2017 tastes like sweet happiness in a glass. It has a pretty floral nose, and by stopping the cold fermentation early, a subtle effervescence was created. Young, low alcohol wines like this aren’t made for aging—they’re meant to be enjoyed chilled, right away. Israeli Moscato & Italian Zabaglione pairs well with me needing to practice making Zabaglione. Stephanie from Gregory + Vine was nice enough to send me this bottle, which included a great, simple recipe for making Zabaglione al Moscato. It’s an airy, light custard that requires only 3 ingredients: egg yolks, sugar, and Mount Hermon Moscato. Since Valentine’s Day is coming up, why not try it too!? Fun Fact: Moscato also pairs well with Asian food. Try it with spicy Thai! Disclaimer: I had never heard of this dessert nor have I ever whisked egg yolks, sugar, and sweet wine into submission. Within several minutes it fluffs into a dreamy, foamy texture! Ok, so after that initial foamy texture success, my first attempt at making Zabaglione was a serious FAIL. Instead of a creamy custard, I created lukewarm egg foam. Mmm… egg foam. As a novice dessert maker, I thought (hoped) it might firm up into a custard-like texture with time?? It does not. Just remember when you do this warm water “bath” it does need to heat up enough. I’ll try again, because the dessert looks so good. Plus, it has minimal ingredients, which I prefer. Oh well… it did look pretty! The photo below is from Gregory + Vine and shows how beautifully it can all come together. Worst case scenario you just drink the wine and eat the organic strawberries plain. Ingredients: 3 large egg yolks (bring them to room temp before whisking), 2 tablespoons of sugar, 1/4 cup Mount Hermon Moscato. Equipment: Bowl (non-reactive metal or glass), Water bath that fits your bowl nicely, and a Whisk. 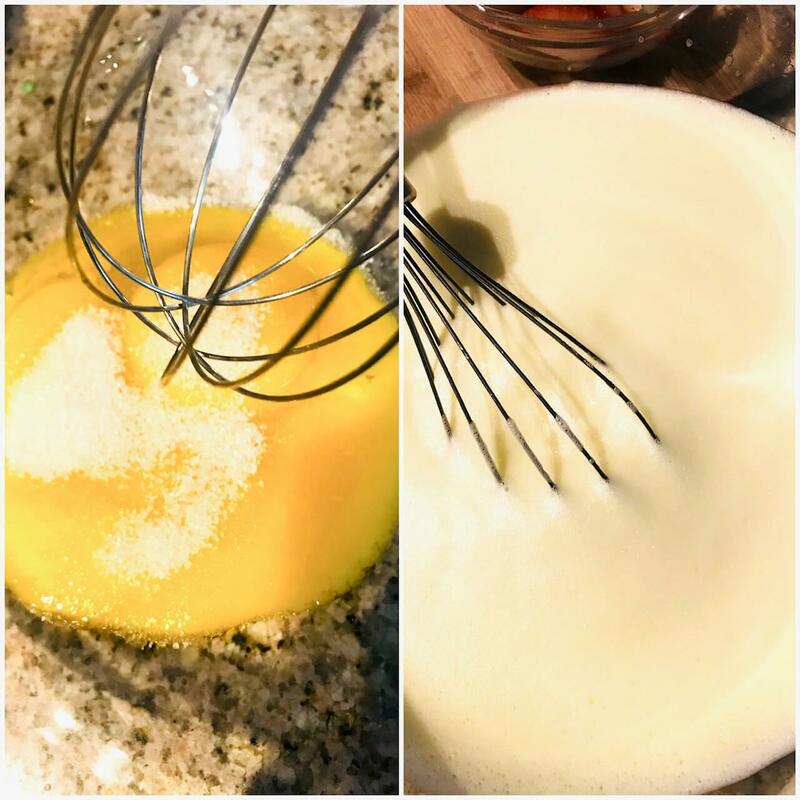 Lightly whisk egg yolks, sugar, & Moscato in a bowl. Place bowl over a hot water bath set to low heat & continue whisking. Don’t stop whisking as you don’t want to make scrambled eggs. The mixture will start to foam and become a thick, yet foamy custard (~10 minutes). *It should be hot to the touch (this is where I went wayyyy wronnng). Carefully remove from heat. Serve into cute dessert cups and top with fresh strawberries.